Aleksandra Drecun, the president of Intersection, was invited by the project coordinator to participate in the Conference organized by GENERA project. The Conference was dedicated to gender equality in research, having special focus on women researchers in the field of physics. 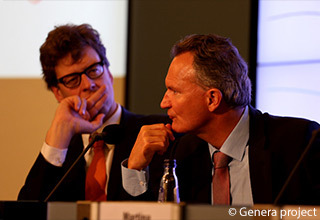 Robert-Jan Smits, EC Director General, in his keynote speech stressed the importance of improving gender awareness in the briefings of the Horizon 2020 evaluators, the experts assessing research proposals competing for EU funds for research. More information related to GENERA project and the Conference where the project was kicked-off can be found here. The Conference program can be found here. Portia is part of the consortium that has been awarded Horizon 2020 funding for a new project GENERA (Gender Equality Network in the European Research Area). Under the GERI-2014-1 call, GENERA consortium has been formed to apply a bottom-up approach to enhance gender equality in the field of physics research as a benchmark for other sciences. GENERA comprises a starting set of organisations active in the field of physics, which are committed to the implementation of the project and to the achievement of its milestones. The project will last three years and is co-ordinated by Desy (Deutsches Elektronen-Synchrotron A Research Centre of the Helmholtz Association) and is officially launched on 1 September 2015. Participants include: Max Plank Society (Germany), FOM (Netherlands), Fraunhofer Gesellschaft (Germany), Karlsruher Institute fuer Technologie (Germany), Instituto Nazionale di Fisica Nucleare (Italy), Centre National de Recherce Scientifique (France) and other leading European research organizations. GENERA aims to continue, monitor and improve the Gender Equality Plans of Research Institutions and Organizations specifically in the physics research field. These three actions will be performed by a Consortium of 12 beneficiary partner research performing and research funding organizations, and a number of associate partners and observers. The GENERA Consortium includes a considerable representation of women physicists active in the career at different levels and will engage with further women physicists active in various Institutions to benchmark and monitor the effectiveness of already active and previously proposed measures and the ones which will be proposed by the Consortium. The end goal is to propose and create organizational structures allowing physics research in Europe to benefit from the greater presence of talented women at all levels, and which can open up more opportunities for women to create successful careers in physics research and in related fields. While the end goal will focus on the research world, GENERA will look into the origin of the problem by creating liaisons with schools and proposing suitable programs to foster the field from early stages and to propose measures that can be adopted by middle and high schools. Another major goal of GENERA is to contribute to overcome the under-representation of women in physics research which is long-standing and persistent even if the prevailing cultures adopt the assumption of being ‘gender neutral’. Still these assumptions did not produce the desired effect of increasing female representation in the physics research field. 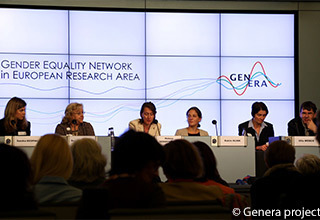 GENERA will focus on the implementation by European research organization of Gender Equality Plans customized to circumstances and needs of the physics research community. The customised Gender Equality Plans involve systematic examination of all decision-making processes to identify any possible sources of gender bias in the research organisations active in physics and related fields. Project "DEBATE SCIENCE! European Student Parliaments"
Based in Belgrade, Serbia, “Intersection. Centre for Science and Innovation” is an international action tank, a non-profit civil society association, established to promote responsible research and innovation, quality education, evidence based policies and good governance and to strengthen the link between science and society, with special focus on Central and Southeastern Europe. Intersection initiates and stimulates research and dialogue on important societal challenges, advocates for structural changes in research performing and research funding organizations in order to advance the integration of RRI policy in their agendas and supports open discussion and co-creation in research and innovation processes.